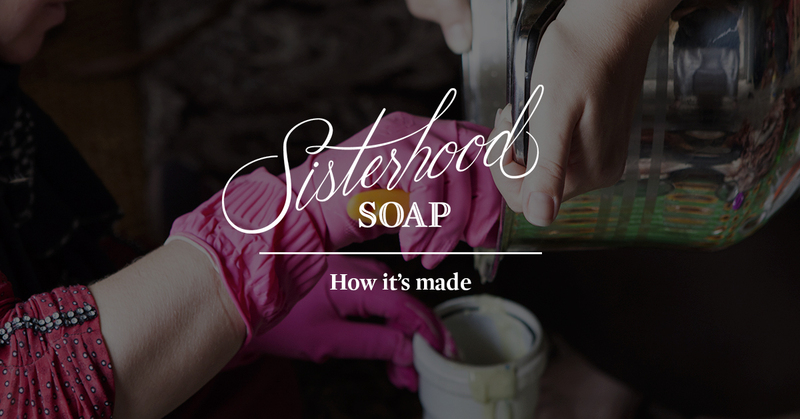 Want to See How Sisterhood Soap Is Made? Making soap is a beautiful process, especially when it’s soap that can remake lives. We thought you might like to see how refugees make each bar of Sisterhood Soap. First, you need a mold. No fancy equipment here—for round bars of soap, something as simple as a PVC pipe will do just fine! Then, refugees make a tea using chamomile, eucalyptus, or wild herbs. They’re often creating new blends, with one simple rule: if it doesn’t grow naturally, they don’t use it in their soap. Next is where the chemistry happens. Refugees carefully measure out lye (while wearing protective gear!) and mix it with the tea. Then it’s time to combine the tea mixture with olive oil and whisk. A LOT. If you have an immersion blender, even better. Though in a place where electricity is an unpredictable luxury, sometimes you have to get creative about how you power your blender! When making natural soap, the lye and fat molecules are combined and transformed through a process known as saponification. This is how soap has been made for thousands of years. The finished product is never rough or caustic. In fact, natural soap has soothing properties that most chemically manufactured alternatives lack. Once everything is mixed and saponified, the soapmaker pours the mixture into the mold. Now it’s time to let it set for 24 hours. Then the soap is removed and cut into bars so it can cure for a bit before being shipped off to you. There you go—that’s how Sisterhood Soap is made! But even more important than HOW it’s made is WHY it’s made. Every bar they sell is one more step toward reclaiming their future. Every bar they sell means income for their family—to pay rent, buy food, purchase school uniforms. Every bar washes away a little more of the violence and devastation wrought by groups like ISIS. When you support a refugee soapmaker, you get to hold their work in their hands—and share in their story.